Nutritional disorder – copper (Cu) deficiency. Copper (Cu) deficiency is extremely rare, consequently it is not normally seen in field conditions. To help with the diagnosis and treatment of copper deficiency, we induced copper stress under controlled greenhouse studies. In NC State University trials, symptoms first developed in the middle part of the plant. 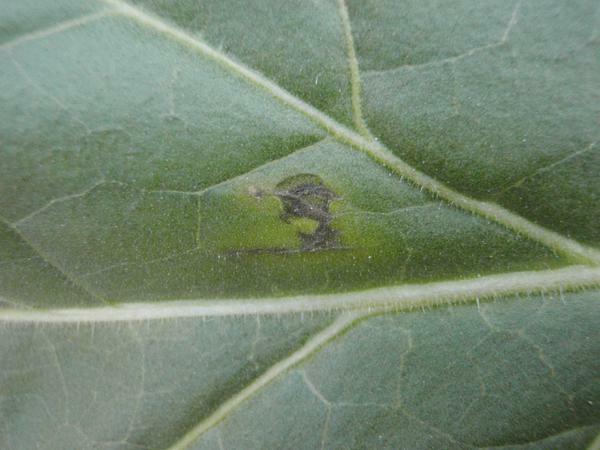 The middle region of the leaf developed brown veins, which quickly turned black (Figure 1, Figure 2, Figure 3, Figure 4). The tissue surrounding the veins became chlorotic. Symptoms progress up the plant to the younger leaves. (Descriptions based on the book, Hunger Signs of Crops, 3rd Edition, edited by H.B. Sprague.) 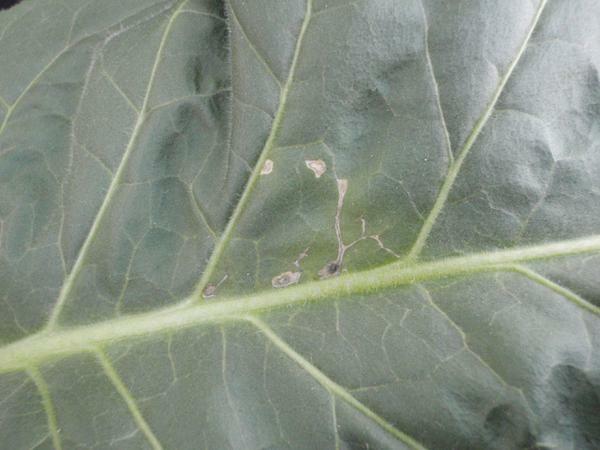 Under controlled greenhouse conditions, tobacco plants are stunted when Cu is limited. The upper foliage of the plant may also have a wilted appearance. The upper part of the plant lacks rigidity and when flowering the stalk will bend over. In ornamental tobacco (Nicotiana alata), the initial symptoms were an overall yellowing of the foliage in conjunction with overall dwarfing. Advanced symptoms can be seen in Figure 5 and Figure 6. Figure 1. 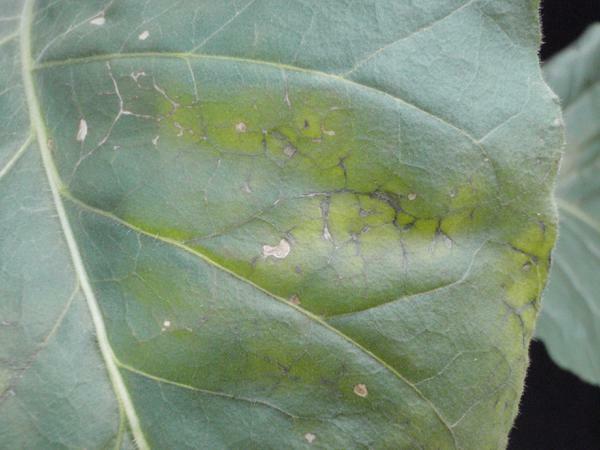 Initial symptoms of copper deficiency with the brown veins. Figure 2. As symptoms progress, the veins turn black. Figure 3. The black tissue expands with Cu deficiency. Figure 4. 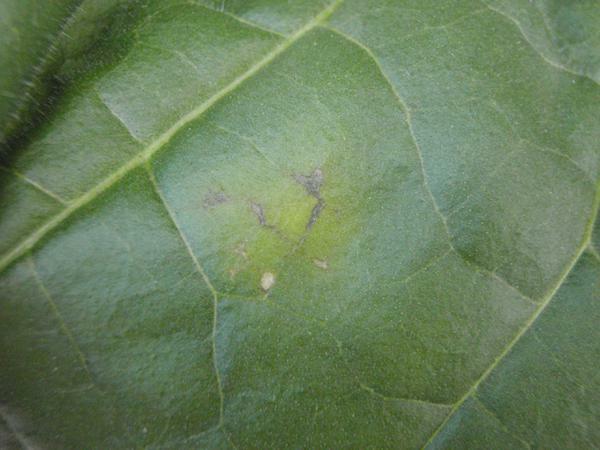 Chlorotic areas develop around the black veins. Figure 5. Advanced Cu deficiency. Figure 6. Advanced Cu deficiency. Copper is required is very low concentrations, so deficiencies under field conditions is unlikely. If you suspect a copper deficiency, take a sample for analysis. The sufficiency range for copper is between 5 and 10 ppm for burley tobacco. A slight refinement of the range is available for flue cured tobacco, with 5 to 10 ppm copper being recommended from planting until maturity, and a lower range of 4 to 10 ppm recommended at harvest for the middle leaves or 3 to 10 ppm for the lower leaves. Provide copper with your fertilization program.